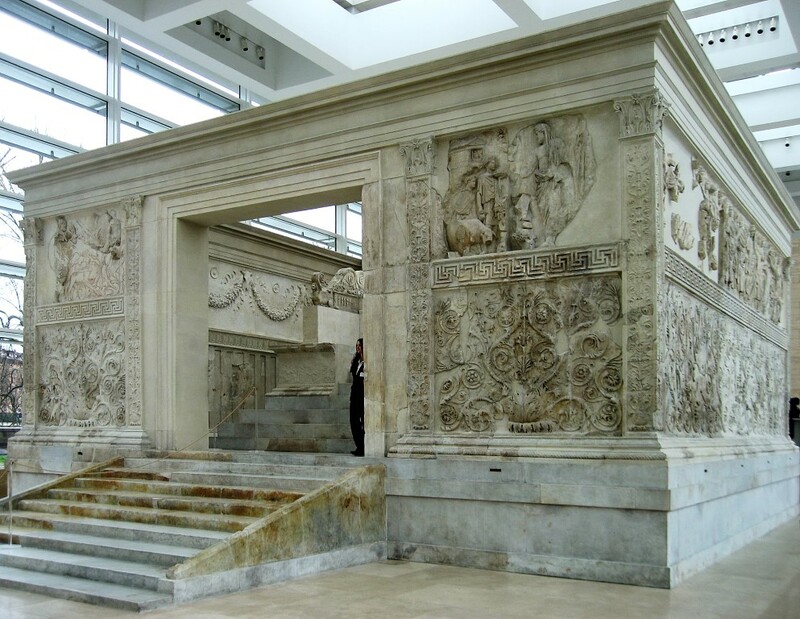 The Ara Pacis is considered one of the most important monuments of the beginning of the Empire, erected nine years B.C. in honour of the Emperor Augustus, on his return from Gallia and Spain, and in commemoration of the peace re-established by this Emperor in the Roman World. The first bas-relief on the right that we upon entering the monument is believed by the historians to represent an episode narrated by Virgil in 3rd book of Aeneid. It depicts Enea at the end of his wandering through the world, in the act of offering a sacrifice. In front of him are 2 camilli (servants for the sacrifice) one of whom is leading a sow about to be offered. High up, behind the servants, is a small temple to the Penates, ( or household gods). Although not well preserved this bas-relief is considered to be the best part of the monuments. The long bas-reliefs on the side of Via Ripetta represents the consecration ceremony of the monument, which took place on July 4th 13 B.C. at the return of the Emperor from his victorious campaign. Only some fragments are preserved of the first part of the religious procession, and it is believed that these who is seen with his head covered by a toga. The figures immediately behind Augustus, who succeeded the emperor to the throne. The so-called Flamini follow, distinguished by the peculiar sacerdotal cap, then comes a “victimarious” a pagan priest, distinguishable by the axe he carries on his shoulder. The next figure, is believed to be Agrippa the great admiral and general, the emperor son-in-law. Next to him is a young woman, believed to be Julia, the lovely daughter of the emperor and wife of Agrippa. Between: them is one of their two sons, Lucius or Caius. The woman in the background, whose hand is resting on the child’s head, is believed to be Livia, wife of the emperor, and mother of Tiberius. The figure of a young man near Julia is believed to be another portrait of Tiberius who after the death of Agrippa, became Julia’s third husband. Other members of the imperial family are represented on the other slab, where two figures who stand facing each other are recognised by the majority of scholars as Antonia, the younger daughter of Mark Antony and Octavia, sister of Augustus. The man is believed to be Claudius Drusus, second son of Livia, stepson of Augustus. The child is perhaps, Germaincus. On the side of the exit is a lovely figure of a woman with child on her hand; the one on the right is represented as playing with a bunch of fruit, the other is climbing on the breast of the woman. This figure, according to some historians, is believed to be Tellus ( the goddess of the Earth) while others think is represents Italy. The fragment of a figure on the other side is supposed to represent Rome. The other bas-reliefs on the Tiber side, represents the continuation of the religious procession, but there is no hope or possibility of identifying the different personages because all the original heads were broken at its discovery, and the present ones are created by artists on the 18th century.